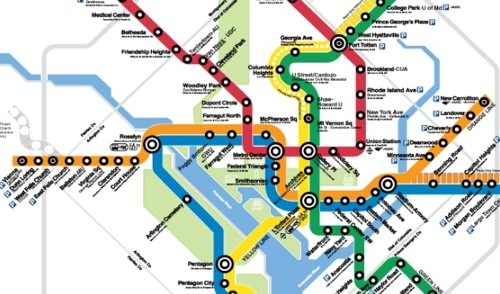 Metro’s iconic map is at a turning point. The new Silver Line that’s being constructed out to Dulles Airport presents a challenge for the transit system’s existing map, as it would push outward the boundaries on the system past the edge of the page. As part of the upcoming changes, Metro has released a draft map (that we’ve excerpted from above) and a survey to go with it. The heart of the changes, for now at least, have to do with changes in the green line (to more correctly display its geography), and the orange and yellow line service extensions that operate during Metro’s rush hours. The yellow line now shows a dashed line (though a striped line is also proposed in the survey) down to Springfield, and up to Greenbelt, and the orange line has a dashed section out to Largo. Mysterious and ghostly is how they’ve chosen to draw the Silver Line outward through Tysons to Dulles for now, largely postponing the question of where the map’s new boundaries will be. Greater Greater Washington’s David Alpert has dissected the map with regard to the site’s mapping contest, and has a series of great recommendations and observations. Definitely give it a look. Also, Metro’s Barbara Richardson spoke with the Post’s chat group this morning at 10am, and that chat will likely be instructive with regards to what Metro was considering with regard to the map. Personally, I think the new map is a welcome improvement in a number of ways: it highlights the increased service to Fort Totten on the yellow line and differentiates between the extended yellow line service to Greenbelt in a manner that’s elegant, and also does the same for the orange line out to Largo. It also thickens the orange/blue line between Rosslyn and Stadium-Armory to allow for a silver line when the time comes for it to actually run. This is a ground-work laying map that will hopefully serve us until 2013 when the new map, and new line, debut service out to Tysons. I don’t understand how this is a ‘redesign’ – it’s just a tweak. 95% of everything is the same. Why even pay the original designer to do this?